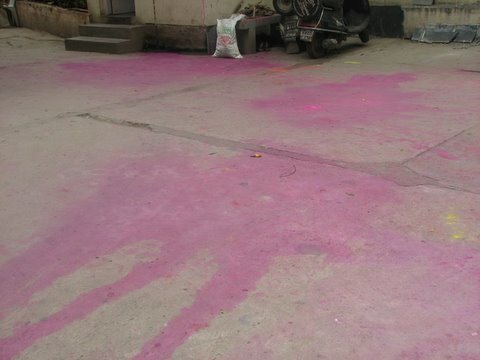 After celebrating Holi and a long weekend, one would expect Bangaloreans to be in the pink of health. But alas, it is not only the health which is pink…. Who is going to wear those clothes? Or will they be set aside for next year’s celebrations? Every year, the newspapers and the media stress the importance of getting “safe” and eco-friendly colours to play Holi with. But the point is, when young children go to the nearest shop to buy colours, what’s on offer? That’s what will be used, whether the colours are safe or not. 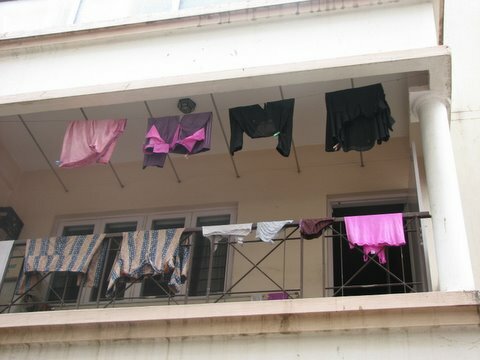 If this pink colour can stain clothing and cement so much, what would it be doing to the sensitive skin of children, I wonder! Today is unique; as my friend put it, it is “Amar Akbar Anthony” or “Ram Rahim Robert” day. Holi, Milad-un-Nabi (the birthday of the Holy Prophet Muhammad, Peace Be Upon Him) and Good Friday are all being celebrated today. It is probably simplistic and idealistic to wish, as someone I know did, that each community feeds sweets to the others; but I do think that’s such a nice thing to wish for, anyway! Having been born a Hindu, I have been privileged to be exposed to Christianity and Islam as well. We lived near two churches where I would visit very often; they were quiet citadels of peace where one could “recharge one’s battery” as it were. I would attend midnight Mass regularly during Christmas; the service on Palm Sunday, when everyone would walk out of the cathedral with candles in their hands, is still etched in my memory. When I moved to this city, I lived within walking distance of two mosques, and learnt to understand the call of the muezzin to prayer; and realized that the words addressed to God mean much the same no matter what the religion. I also had a neighbour who was very knowledgeable about Islam and the Quran, and shared some of that with me. On Muslim festival days, I would get kheer (specially prepared for me as I was a vegetarian!) from her home, and I would send across “payasam” and “vadai” on Hindu festival days. And since I grew up in the north of India, Holi was also something we celebrated though we hailed from the South. In fact, being in a land different from one’s own meant, to me, that one had more festivals than just one’s own, to celebrate! So, for me, colours have a special meaning. Like the rainbow, I strongly believe that humanity comes in all colours of beliefs, and each of them is as valid as the other, provided each does not hurt anyone else. To me, the Festival of Colours is not just a Hindu festival, but a secular one, celebrating differences. Today as I went about my shopping chores, I watched so many children drenched in many colours, dodging about happily; and I thought I would like to share, not the colours created by human beings, but the colours that Nature herself has created and shared with us. 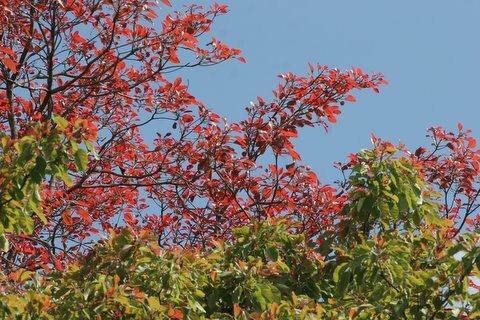 The blue of the sky, the red of the new leaves, the greens of the older ones…Nature indulges Herself in colours, variety, and differences, too. 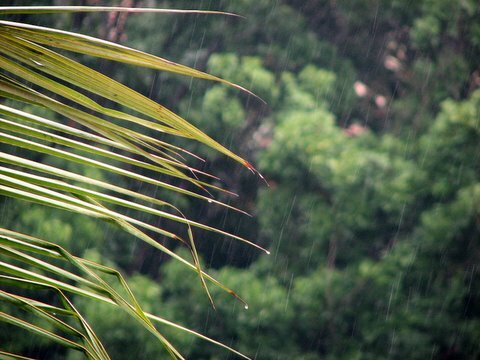 The raindrops fall, and they dance at the tip of the palm fronds; they bring life to the trees and the plants of Bangalore, and bring a reminder that green is a colour that seems to be fast vanishing from our environs, and being replaced by the grey of concrete. So as we celebrate one or more of the three festivals of today, let’s remember two things: One, to respect our differences…it takes seven colours to produce the beauty of a rainbow, and two, to protect the colour green in our city!